Clinton Devon Estates, RSPB, Restoration, Management. The commons encompass many areas of historical and archaeological interest, including a hill fort, some seventeen burial mounds and a fire beacon. The commons are laid down on Triassic pebblebeds that are thought to come from an area of desert that extended over the English Channel to France. Vast rivers flowed across the basin depositing the layers of pebblebeds which we now associate with the commons. (Visit Woodbury Geology for more information). During its life time, the commons were on the edge of the last ice age, being mostly Arctic Tundra. As the ice age retreated aforestation started to build the area into a vast forest. Man then came along and started to shape the face of the commons. Around 500-300 B.C. man moved into the area and built a hill fort, now known as Woodbury Castle. This is a scheduled ancient monument. Man gradually cleared the trees for fire wood, buildings, etc. With the establishment of the local manors and the division of the land into parishes, the Lord of the Manor allowed commoners rights of grazing, turf cutting, the taking of bracken for bedding and the cutting of certain sizes of trees for fuel. This went on for many years until the locals became richer and stopped using their common rights. The commons were then allowed to fall into their own succession of growth from heather and gorse to the invasion of trees, bracken, etc. If this had been allowed to go on unchecked, one of the most valuable lowland heaths in the country would have been lost. 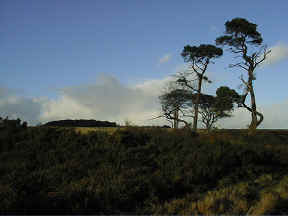 The Area of the East Devon Pebblebed Heaths covers all of Woodbury and the adjacent commons, and is a Site of Special Scientific Interest (SSSI). This whole area is owned by Clinton Devon Estates and together with Mutters Moor to the West of Sidmouth, falls within the East Devon Area of Outstanding Natural Beauty (AONB). Woodbury Common has the additional status of a "Special Protection Area" (SPA), as well as being proposed as a "Special Area for Conservation" (SAC). Both of these are European Union designations and enable European funding to be sought. A management plan was produced for the Estate by NCC (English Nature) in consultation with other conservation bodies. Conservation work is carried out in accordance with this plan by the Wardens assisted by volunteers. Clinton Devon Estates are owners of most of the lowland heath locally known as Woodbury Common. The Estate have always been proud of the commons and have successfully managed it for many years, leasing out Aylesbeare and Harpford Common to the RSPB. In 1989 the Estate employed a full-time Warden/Manager who with other interested parties drew up a 10-year management plan. All work has been approved by English Nature, the Government body responsible for SSSI (Site of Special Scientific Interest). Traditional lowland heathland covered broad swathes of Southern Britain, but changes in agriculture, lack of grazing, encroaching scrub and urban development have meant that the habitat has declined rapidly with just isolated pockets remaining. So how do we conserve this habitat? It must be carefully managed with tree and scrub clearance, controlled burning of vegetation at strategic points, both to clear dead material and to promote grass growth for low intensity cattle grazing. Gorse has to be coppiced at regular intervals to promote a better and more varied habitat. Bracken is also cleared - we do this in many ways; the best way being to scrape an area with a bulldozer until just above the pebble beds. If this is done in early February or March when we have frosts, the bare rhizomes of the plants are exposed and die. We also use chemical spray and a roller. In areas of wet heath cattle are used as a grazing tool. They will eat and break down the hard tussocks of grass, leaving the wet areas open for a better type of flora and fauna to colonise. We now have four areas which are actively grazed during the summer months. It is hoped that the grazing cattle will open up the wet areas for the rare Southern Damselfly. In 1997 Clinton Devon Estates decided, as part of their ongoing commitment to this nationally important habitat, to clear fell 35 hectares of pine forestry and restore it to heathland. This has already shown signs of success with heathland plants returning. 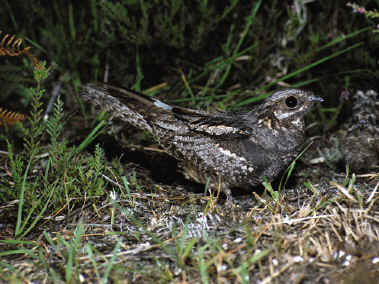 During the summer of 1998 the rare Nightjar, a summer bird visitor, was spotted in the area. Nightjars are summer visitors to East Devon Heathlands and are mainly active at night. 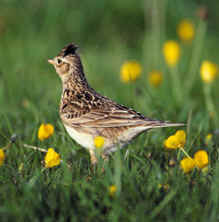 Photo courtesy RSPB. It is estimated that over 800,000 people use the commons in a year. The Estate is trying to both create the ambience for the visitor and preserve the rare flora and fauna.